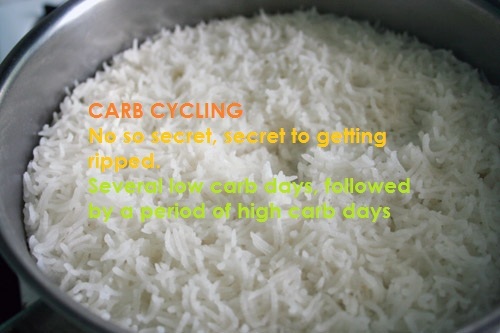 Today I will be telling you about carbohydrate cycling which is a method used by bodybuilders to get shredded. Last month I wrote a post about carbohydrates, so this post will feed you more information on how to use carbs to get the body you dream of having. I will just be telling you about the basics of carb cycling and why bodybuilders and fitness models use this method of carb intake manipulation. Carb cycling also known as a cyclic ketogenic diet is when you have a low carbohydrate diet where you consume very low levels of carbohydrates for most days followed by a day/period where you increase the amounts of carbs you consume (period of carb loading). Most of your calories in this kind of diet come from fats and proteins when you are not on carb loading days/periods. Carb cycling is meant to maximize fat burning while also building muscle which makes it a favourite in bodybuilding circles. Carb cycling is done to bring the body to a state of ketosis, which is when the body burns fat instead of glucose for fuel (glucose coming from carbohydrates, with the lack of carbs in this diet you force the body to use fat as fuel). Carb cycling is a smart way to trick the body into burning fat, now you know how those bodybuilders manage to maintain their size and still look lean with low body fat. This is the best way to get cut the natural way without the aid of performance enhancing drugs. Most diets are very high carbohydrate based so it could be tricky at first cutting your carbohydrates to very low amounts. Cutting your carbs since they are What is usually used as fuel by your body will have an instant effect on your energy levels, you will have a dip in energy as your body adjusts and that will affect your daily activities and your workouts, you will not be able to exert yourself as you did before at first but you will adapt and get used to it. Why you need high carb days? Your body was not made to function on low carbs, carb cycling just tricks it into using fat as fuel. You need the high carb days or periods of carb loading to replenish your energy stores (muscle glycogen levels) so that you have energy and are not the living dead, to keep your metabolism high (if you are without enough carbs for too long your metabolic rate will decrease making it harder for you to lose fat) and so you do not start losing muscle. On my last post on carbohydrates I wrote that one way to make sure that you do not gain unnecessary fat by storing carbs as fat is to eat more carbs on days when you are the most active and that is on workout days and to eat less carbs on days when you are not active, that is on rest days. This is a form of manipulating your carb intake to suit activity level.